Chemistry addresses topics such as how atoms and molecules interact via chemical bonds to form new chemical compounds. There are four types of chemical bonds: covalent bonds, in which compounds share one or more electron(s); ionic bonds, in which a compound donates one or more electrons to another compound to produce ions (cations and anions); hydrogen bonds; and Van der Waals force bonds. 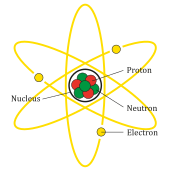 The atom is the basic unit of chemistry. It consists of a dense core called the atomic nucleus surrounded by a space occupied by an electron cloud. The nucleus is made up of positively charged protons and uncharged neutrons (together called nucleons), while the electron cloud consists of negatively charged electrons which orbit the nucleus. In a neutral atom, the negatively charged electrons balance out the positive charge of the protons. The nucleus is dense; the mass of a nucleon is approximately 1,836 times that of an electron, yet the radius of an atom is about 10,000 times that of its nucleus. 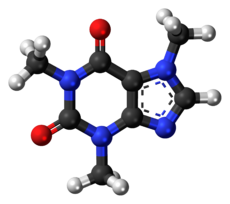 A ball-and-stick representation of the caffeine molecule (C8H10N4O2). One of the main characteristics of a molecule is its geometry often called its structure. While the structure of diatomic, triatomic or tetra-atomic molecules may be trivial, (linear, angular pyramidal etc.) the structure of polyatomic molecules, that are constituted of more than six atoms (of several elements) can be crucial for its chemical nature. Diagram showing relationships among the phases and the terms used to describe phase changes. Sometimes the distinction between phases can be continuous instead of having a discrete boundary' in this case the matter is considered to be in a supercritical state. When three states meet based on the conditions, it is known as a triple point and since this is invariant, it is a convenient way to define a set of conditions. In the methane molecule (CH4), the carbon atom shares a pair of valence electrons with each of the four hydrogen atoms. Thus, the octet rule is satisfied for C-atom (it has eight electrons in its valence shell) and the duet rule is satisfied for the H-atoms (they have two electrons in their valence shells). – that is the probability of a molecule to have energy greater than or equal to E at the given temperature T. This exponential dependence of a reaction rate on temperature is known as the Arrhenius equation. The activation energy necessary for a chemical reaction to occur can be in the form of heat, light, electricity or mechanical force in the form of ultrasound. ; if it is equal to zero the chemical reaction is said to be at equilibrium. Chemical reactions can result in the formation or dissociation of molecules, that is, molecules breaking apart to form two or more molecules or rearrangement of atoms within or across molecules. Chemical reactions usually involve the making or breaking of chemical bonds. 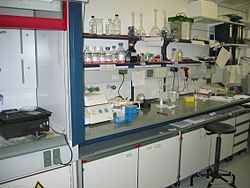 Oxidation, reduction, dissociation, acid-base neutralization and molecular rearrangement are some of the commonly used kinds of chemical reactions. 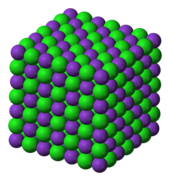 The crystal lattice structure of potassium chloride (KCl), a salt which is formed due to the attraction of K+ cations and Cl− anions. Note how the overall charge of the ionic compound is zero. A substance can often be classified as an acid or a base. There are several different theories which explain acid-base behavior. 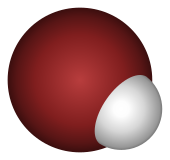 The simplest is Arrhenius theory, which states that acid is a substance that produces hydronium ions when it is dissolved in water, and a base is one that produces hydroxide ions when dissolved in water. According to Brønsted–Lowry acid-base theory, acids are substances that donate a positive hydrogen ion to another substance in a chemical reaction; by extension, a base is the substance which receives that hydrogen ion. Acid strength is commonly measured by two methods. One measurement, based on the Arrhenius definition of acidity, is pH, which is a measurement of the hydronium ion concentration in a solution, as expressed on a negative logarithmic scale. Thus, solutions that have a low pH have a high hydronium ion concentration and can be said to be more acidic. The other measurement, based on the Brønsted–Lowry definition, is the acid dissociation constant (Ka), which measures the relative ability of a substance to act as an acid under the Brønsted–Lowry definition of an acid. That is, substances with a higher Ka are more likely to donate hydrogen ions in chemical reactions than those with lower Ka values. A reductant transfers electrons to another substance and is thus oxidized itself. And because it "donates" electrons it is also called an electron donor. Oxidation and reduction properly refer to a change in oxidation number—the actual transfer of electrons may never occur. Thus, oxidation is better defined as an increase in oxidation number, and reduction as a decrease in oxidation number. The 1730 definition of the word "chemistry", as used by Georg Ernst Stahl, meant the art of resolving mixed, compound, or aggregate bodies into their principles; and of composing such bodies from those principles. In 1837, Jean-Baptiste Dumas considered the word "chemistry" to refer to the science concerned with the laws and effects of molecular forces. This definition further evolved until, in 1947, it came to mean the science of substances: their structure, their properties, and the reactions that change them into other substances – a characterization accepted by Linus Pauling. More recently, in 1998, Professor Raymond Chang broadened the definition of "chemistry" to mean the study of matter and the changes it undergoes. A basic chemical hypothesis first emerged in Classical Greece with the theory of four elements as propounded definitively by Aristotle stating that fire, air, earth and water were the fundamental elements from which everything is formed as a combination. 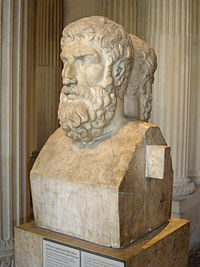 Greek atomism dates back to 440 BC, arising in works by philosophers such as Democritus and Epicurus. In 50 BCE, the Roman philosopher Lucretius expanded upon the theory in his book De rerum natura (On The Nature of Things). Unlike modern concepts of science, Greek atomism was purely philosophical in nature, with little concern for empirical observations and no concern for chemical experiments. Jābir ibn Hayyān (Geber), a Perso-Arab alchemist whose experimental research laid the foundations of chemistry. 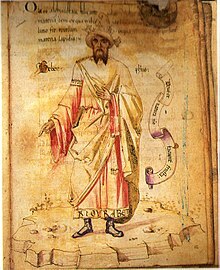 The development of the modern scientific method was slow and arduous, but an early scientific method for chemistry began emerging among early Muslim chemists, beginning with the 9th century Perso-Arab chemist Jābir ibn Hayyān (known as "Geber" in Europe), who is sometimes referred to as "the father of chemistry". He introduced a systematic and experimental approach to scientific research based in the laboratory, in contrast to the ancient Greek and Egyptian alchemists whose works were largely allegorical and often unintelligible. He also introduced the alembic (al-anbiq) of Persian encyclopedist Ibn al-Awwam to Europe, chemically analyzed many chemical substances, composed lapidaries, distinguished between alkalis and acids, and manufactured hundreds of drugs. His books strongly influenced the medieval European alchemists and justified their search for the philosopher's stone. In the Middle Ages, Jabir's treatises on alchemy were translated into Latin and became standard texts for European alchemists. These include the Kitab al-Kimya (titled Book of the Composition of Alchemy in Europe), translated by Robert of Chester (1144); and the Kitab al-Sab'een (Book of Seventy) by Gerard of Cremona (before 1187).Under the influence of the new empirical methods propounded by Sir Francis Bacon and others, a group of chemists at Oxford, Robert Boyle, Robert Hooke and John Mayow began to reshape the old alchemical traditions into a scientific discipline. Boyle in particular is regarded as the founding father of chemistry due to his most important work, the classic chemistry text The Sceptical Chymist where the differentiation is made between the claims of alchemy and the empirical scientific discoveries of the new chemistry. He formulated Boyle's law, rejected the classical "four elements" and proposed a mechanistic alternative of atoms and chemical reactions that could be subject to rigorous experiment. Before his work, though, many important discoveries had been made, specifically relating to the nature of 'air' which was discovered to be composed of many different gases. The Scottish chemist Joseph Black (the first experimental chemist) and the Dutchman J.B. van Helmont discovered carbon dioxide, or what Black called 'fixed air' in 1754; Henry Cavendish discovered hydrogen and elucidated its properties and Joseph Priestley and, independently, Carl Wilhelm Scheele isolated pure oxygen. In his periodic table, Dmitri Mendeleev predicted the existence of 7 new elements, and placed all 60 elements known at the time in their correct places. The development of the electrochemical theory of chemical combinations occurred in the early 19th century as the result of the work of two scientists in particular, J.J. Berzelius and Humphry Davy, made possible by the prior invention of the voltaic pile by Alessandro Volta. 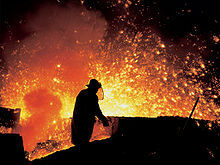 Davy discovered nine new elements including the alkali metals by extracting them from their oxides with electric current. British William Prout first proposed ordering all the elements by their atomic weight as all atoms had a weight that was an exact multiple of the atomic weight of hydrogen. J.A.R. Newlands devised an early table of elements, which was then developed into the modern periodic table of elements in the 1860s by Dmitri Mendeleev and independently by several other scientists including Julius Lothar Meyer. The inert gases, later called the noble gases were discovered by William Ramsay in collaboration with Lord Rayleigh at the end of the century, thereby filling in the basic structure of the table. Bottom: Observed results: a small portion of the particles were deflected, indicating a small, concentrated charge. At the turn of the twentieth century the theoretical underpinnings of chemistry were finally understood due to a series of remarkable discoveries that succeeded in probing and discovering the very nature of the internal structure of atoms. In 1897, J.J. Thomson of Cambridge University discovered the electron and soon after the French scientist Becquerel as well as the couple Pierre and Marie Curie investigated the phenomenon of radioactivity. 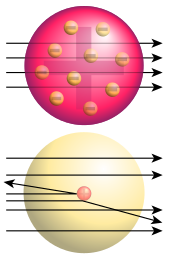 In a series of pioneering scattering experiments Ernest Rutherford at the University of Manchester discovered the internal structure of the atom and the existence of the proton, classified and explained the different types of radioactivity and successfully transmuted the first element by bombarding nitrogen with alpha particles. ^ Carsten Reinhardt. Chemical Sciences in the 20th Century: Bridging Boundaries. Wiley-VCH, 2001. ISBN 3-527-30271-9. pp. 1–2. ^ a b "alchemy", entry in The Oxford English Dictionary, J.A. Simpson and E.S.C. Weiner, vol. 1, 2nd ed., 1989, ISBN 0-19-861213-3. ^ p. 854, "Arabic alchemy", Georges C. Anawati, pp. 853–885 in Encyclopedia of the history of Arabic science, eds. Roshdi Rashed and Régis Morelon, London: Routledge, 1996, vol. 3, ISBN 0-415-12412-3. ^ "chemical bonding". Britannica. Encyclopædia Britannica. Retrieved 1 November 2012. ^ "California Occupational Guide Number 22: Chemists". Calmis.ca.gov. 1999-10-29. Archived from the original on 2011-06-10. Retrieved 2011-06-12. ^ "General Chemistry Online – Companion Notes: Matter". Antoine.frostburg.edu. Retrieved 2011-06-12. ^ Armstrong, James (2012). General, Organic, and Biochemistry: An Applied Approach. Brooks/Cole. p. 48. ISBN 978-0-534-49349-3. ^ Burrows et al. 2008, p. 13. ^ a b Housecroft & Sharpe 2008, p. 2. ^ Burrows et al. 2009, p. 110. ^ Burrows et al. 2008, p. 12. ^ "IUPAC Nomenclature of Organic Chemistry". Acdlabs.com. Retrieved 2011-06-12. ^ Connelly, Neil G.; Damhus, Ture; Hartshorn, Richard M.; Hutton, Alan T. (2005). Nomenclature of Inorganic Chemistry IUPAC Recommendations 2005. RSCPublishing. pp. 5–12. ISBN 978-0-85404-438-2. ^ Hill, J.W. ; Petrucci, R.H.; McCreary, T.W. ; Perry, S.S. (2005). General Chemistry (4th ed.). Upper Saddle River, New Jersey: Pearson Prentice Hall. p. 37. ^ M.M. Avedesian; Hugh Baker. Magnesium and Magnesium Alloys. ASM International. p. 59. ^ "Official SI Unit definitions". Bipm.org. Retrieved 2011-06-12. ^ Burrows et al. 2008, p. 16. ^ Atkins & de Paula 2009, p. 9. ^ Visionlearning. "Chemical Bonding by Anthony Carpi, Ph". visionlearning. Retrieved 2011-06-12. ^ "History of Acidity". Bbc.co.uk. 2004-05-27. Retrieved 2011-06-12. ^ Boyle, Robert (1661). The Sceptical Chymist. New York: Dover Publications, Inc. (reprint). ISBN 978-0-486-42825-3. ^ Glaser, Christopher (1663). Traite de la chymie. Paris. as found in: Kim, Mi Gyung (2003). 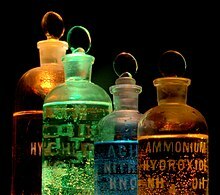 Affinity, That Elusive Dream – A Genealogy of the Chemical Revolution. The MIT Press. ISBN 978-0-262-11273-4. ^ Pauling, Linus (1947). General Chemistry. Dover Publications, Inc. ISBN 978-0-486-65622-9. ^ Chang, Raymond (1998). Chemistry, 6th Ed. New York: McGraw Hill. ISBN 978-0-07-115221-1. ^ Barnes, Ruth. Textiles in Indian Ocean Societies. Routledge. p. 1. ^ Simpson, David (29 June 2005). "Lucretius (c. 99–55 BCE)". The Internet History of Philosophy. Retrieved 2007-01-09. ^ Strodach, George K. (2012). The Art of Happiness. New York: Penguin Classics. pp. 7–8. ISBN 978-0-14-310721-7. ^ "International Year of Chemistry – The History of Chemistry". G.I.T. Laboratory Journal Europe. Feb 25, 2011. Retrieved March 12, 2013. ^ Bryan H. Bunch & Alexander Hellemans (2004). The History of Science and Technology. Houghton Mifflin Harcourt. p. 88. ISBN 978-0-618-22123-3. ^ Marcelin Berthelot, Collection des anciens alchimistes grecs (3 vol., Paris, 1887–1888, p. 161); F. Sherwood Taylor, "The Origins of Greek Alchemy," Ambix 1 (1937), 40. ^ Robert Briffault (1938). The Making of Humanity, pp. 196–197. ^ Cite error: The named reference meyerhoff was invoked but never defined (see the help page). ^ "History – Robert Boyle (1627–1691)". BBC. Retrieved 2011-06-12. ^ Mi Gyung Kim (2003). Affinity, that Elusive Dream: A Genealogy of the Chemical Revolution. MIT Press. p. 440. ISBN 978-0-262-11273-4. ^ Chemistry 412 course notes. "A Brief History of the Development of Periodic Table". Western Oregon University. Retrieved July 20, 2015. ^ Note: "...it is surely true that had Mendeleev never lived modern chemists would be using a Periodic Table" and "Dmitri Mendeleev". Royal Society of Chemistry. Retrieved July 18, 2015. ^ Winter, Mark. "WebElements: the periodic table on the web". The University of Sheffield. Archived from the original on January 4, 2014. Retrieved January 27, 2014. ^ "Julius Lothar Meyer and Dmitri Ivanovich Mendeleev". Science History Institute. June 2016. Retrieved March 20, 2018. ^ "What makes these family likenesses among the elements? In the 1860s everyone was scratching their heads about that, and several scientists moved towards rather similar answers. The man who solved the problem most triumphantly was a young Russian called Dmitri Ivanovich Mendeleev, who visited the salt mine at Wieliczka in 1859." Bronowski, Jacob (1973). The Ascent of Man. Little, Brown and Company. p. 322. ISBN 978-0-316-10930-7. ^ "Chemistry". Chemistry2011.org. Retrieved 2012-03-10. ^ Ihde, Aaron John (1984). The Development of Modern Chemistry. Courier Dover Publications. p. 164. ISBN 978-0-486-64235-2. ^ Tullo, Alexander H. (28 July 2014). "C&EN's Global Top 50 Chemical Firms For 2014". Chemical & Engineering News. American Chemical Society. Retrieved 22 August 2014. "Chemistry" . Encyclopædia Britannica. 6 (11th ed.). 1911. pp. 33–76.